The Melbourne Tabla School is thriving centre for tabla in Australia, providing individual lessons, group classes, concerts, visiting artists, tabla retreats and more. Sam Evans promotes Indian music, world music and intercultural dialog as guest lecturer and ensemble director in numerous educational institutions. The Melbourne Tabla School was established by Sam Evans to cater for the growing demand for tabla training in Australia over a decade ago after extensive study in India with tabla masters Pandit Anindo Chatterjee and Ustad Zakir Hussian. Complementing years of traditional training in India, he holds Bachelor, Honours and Masters degrees in music performance (tabla) and is the first Australian to hold a PhD in tabla. ​The individually designed lessons and classes cater for serious tabla players as well as people who are interested in just having some fun or a looking for hobby. 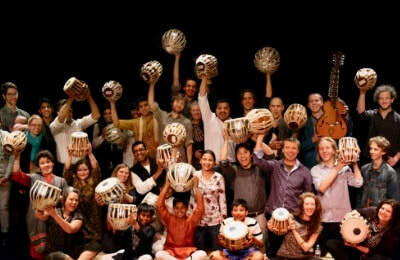 In learning the instrument, all tabla students learn the spoken rhythms of the tabla known as tabla bols. According to each student's needs, lessons cover many aspects of tabla playing, including theka and creative accompaniment, improvisation and expression as well as the more detailed and advanced techniques required to perform the entire repertoire that includes: peshkar, kaida, rela, chalan, tukra, mukra, gat, chakradah and more. The Melbourne Tabla School has been running incursions in primary and secondary schools in Victoria for a decade. The incursions are an engaging, entertaining and educational journey into the similarities and differences between Indian and Australian culture through the fun and exciting medium of music. In the workshops, children are engaged in numerous aspects of Indian culture – many of which are already part of our own multicultural heritage here in Australia, such as yoga and language - yes, the word ‘jungle’ comes from Sanskrit! ​Children get the opportunity to listen to professional musicians playing traditional Indian music in an exciting and polished program that culminates in the students learning to play the instruments and celebrate in our similarities and differences. 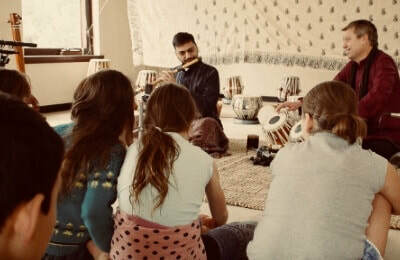 Every student participates in the workshop through the spoken rhythms of the tabla and singing melodies of the ragas in sargam (Indian solfege). The workshops are run by Dr. Sam Evans, founding director of the Melbourne Tabla School, who has dedicated his career to the proliferation of Indian music and culture in Australia along with Indian melodic accompaniment on instruments such as sitar, bansuri, sarod and voice. Sam Evans has dedicated his career to integrating the culture, music and instruments of India in Australia. He provides guest lectures and lecture demonstrations on Indian music, world music, Indian rhythm, and the tabla, to numerous educational institutions in Australia including Monash University, Melbourne University and Melbourne Polytechnic. 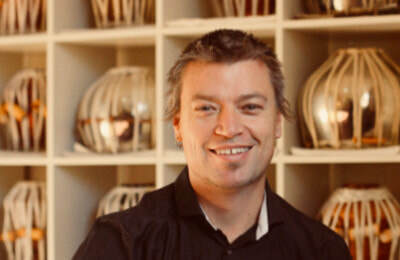 His work in directing the Monash University World Music Orchestra for twelve years has been documented in the Oxford Handbook of Music Education. In further integrating the tabla in formal education in Australia, he has established a pathway for students to study tabla at secondary and University level in Australia. Following many years of study in the traditional training system of guru-shishya-parampara in India, as well as Bachelor, Honours and Masters degrees in traditional tabla, Sam has just completed Australia’s first research P.hD on the tabla. His P.hD research considers the integration of the tabla in contemporary intercultural music in Australia. He now promotes cultural and musical understanding and dialog from a lived experience of both cultures. His expertise in the field have many times been acknowledged by the state and federal funding bodies; The Australia Arts Council, Arts Victoria, Ian Potter Foundation, Australia Postgraduate Award and the prestigious Sir James McNeil Award. © COPYRIGHT SAM EVANS 2018. ALL RIGHTS RESERVED.